Who are Diamond Industrial Painters Ltd. - General Industrial & Commercial Painting Contractors. 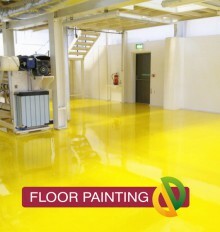 Diamond Industrial Painters Ltd. – General Industrial & Commercial Painting Contractors. The company was founded by Gerard Nicholl in 1989 and we’ve been working with main contractors and business owners ever since! Diamond Industrial Painters Ltd. commitment to excellence enhances our customers’ pride in ownership, knowing that they live and work in finely decorated, enduring and pleasant surroundings. From your first call, you will experience the difference with Diamond Industrial Painters Ltd. In every detail of your project, from initial contact to completion you will find that the people at Diamond Industrial Painters Ltd. are devoted to the utmost professionalism and achieving superior results. We cut no corners here; every employee is properly trained, and we only use premium quality products, in short you can expect good old fashioned quality work at an affordable rate. Diamond Industrial Painters Ltd. employees enjoy working here; you won’t find the usual jaded attitude and negativity that has ruined so many people’s trust in contractors. Diamond Industrial Painters Ltd. – we work year round and not seasonally like many of our competitors. Diamond Industrial Painters Ltd. prides itself on employing only those of exemplary character and training them to do things our way thus exceeding the quality and service expectations of their discerning clientele. Finally, before entrusting your order to a contractor, it is essential to know who will be working on your project, each and every employee here at Diamond Industrial Painters Ltd. is CSCS carded and CRB checked. We are Gross Status with HMRC, Safe contractor and Chas accredited. Please take a few minutes to browse through our customer testimonials to learn a little more about us. We are a good all round general painting contractor specialising in cladding coating, floor coating, roof coating, cut edge, intumescent coatings, window respraying, steel painting, car park lining, industrial ceiling painting.